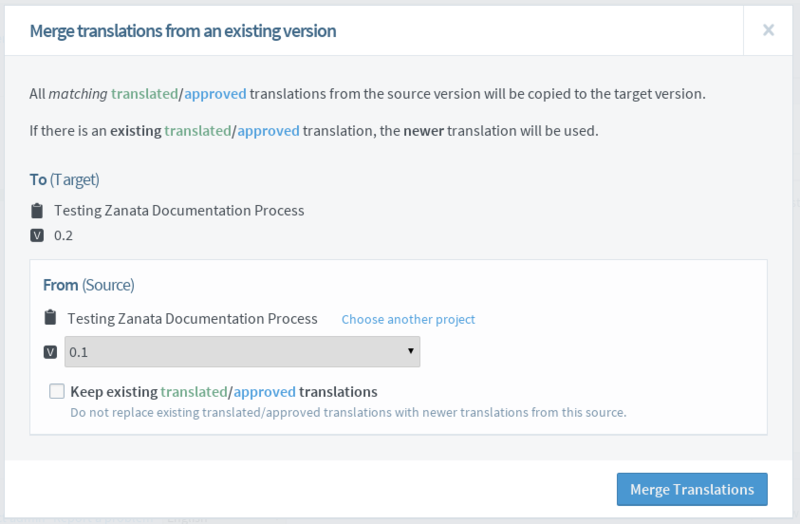 Merge translation allows project maintainer to merge translations between 2 project versions. Only matching translate/approved translations from source version will be copied to the target version. If there is an existing translate/approved translations, the newer translation will be used. 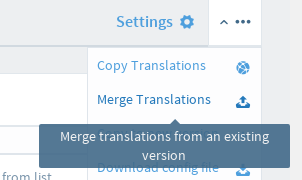 Navigate to the project version page you wish to merge translations to. Click on More action menu on the top right. Select Merge translations. In popup windows, select your project and version that you want to copy translation from. Keep existing translated/approved translations - select if you do not want to merge translation to replace existing translated/approved translations with newer translations from this source. Click Merge Translations to start.